Capture the delicate branches, sweeping silhouettes, and verdant green colors in bonsai, under the guidance of artist, Tina Thieme Brown. 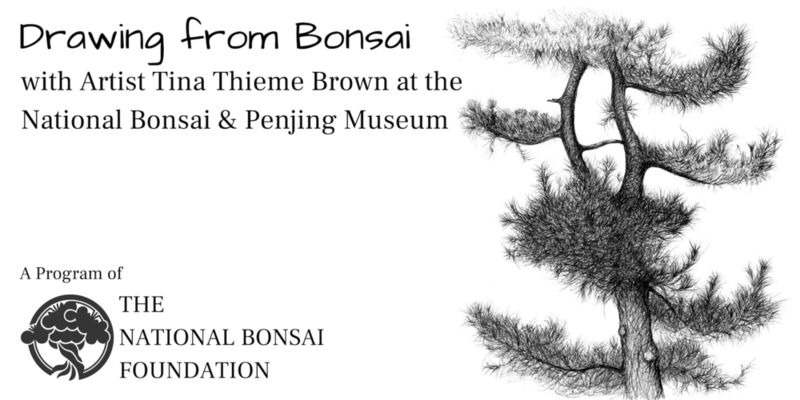 The National Bonsai Foundation is delighted to present “Drawing Bonsai with Artist Tina Thieme Brown, a botanical artist and instructor who specializes in illustrating the landscape, flora and fauna of the greater D.C. area. In this three-hour workshop, Tina will guide participants through the steps and techniques necessary to create an image of bonsai and the Japanese Stroll Garden in a sketchbook. This workshop offers a unique opportunity to get “up close and personal” with some of the most historic bonsai in the world, and to take a small part of them home with you.